We often hear stories of the people who was able to retire in their 30s and are so envious of their situation. They must have rich parents or high income earner. How close to the truth is that? We have a group of individuals who may be able to retire early or be financially independent. The idea of being financially independent is that they amassed wealth machine(s) that create adequate wealth cash flow to pay for their current annual expenses for a large part of their lives. As a society, some of us deliberately choose, or accidentally fell into profession where, from a young age we earned a much better income then our peers. Some professions I can think of are STEM trained individuals (STEM stands for Science, Technology, Engineering and Maths) or the young workers working in finance areas. Largely in Singapore, groups of young civil servants can quickly have their pay stepped up to SG$80,000/yr at a young age. These folks, if they control what they want in life, optimize their expenses, choose to start building wealth, continue to maximize their income at their job are the ideal candidates to earn $1 million by age 40. With $1 million, it creates different options for them. We could simulate this with our Wealth Calculator, which I talked about in my Wealthy Forumla article. Assuming he is privileged to start off with a high salary relatively. Aggressively in putting a large part of his income to his wealth machine. He will funnel 80% of his initial disposable income of $5,000 with 2 month’s bonus to building wealth. 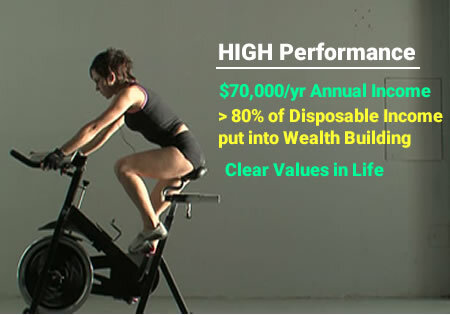 Subsequently 20% of his annual increment of 3% will go to building wealth. Start Wealth Building Early. He decides to start building out of university and will have 15 years till age 40 to build wealth. At the end of 15 years, he would have accumulate a portfolio wealth of $1.1 mil. 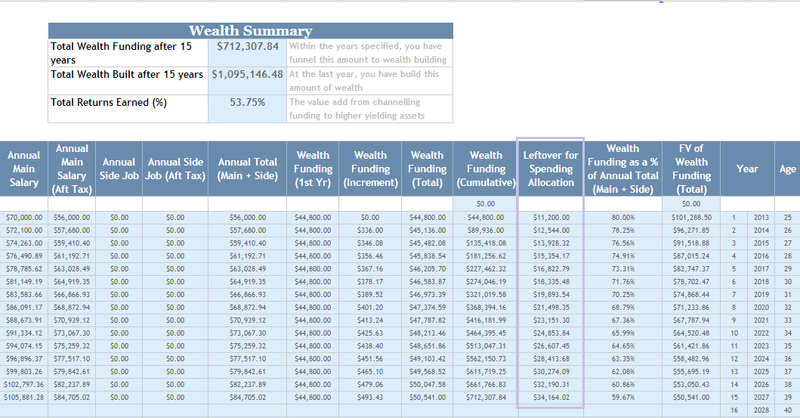 He funded nearly $45,000 of his first year $56,000 salary (look under Wealth Funding Total). At the end of the 15 years, his wealth funding only increase by $5,000 more. The reward for this chap is that at this point, with a safe withdrawal rate of 3% per year, he would have $32,654/yr or $2,737/mth in wealth cash flow, which is more or less equal to his current annual expenses at age 40 (look under Leftover for Spending Allocation column). 3% looks conservative, but if you want the amount to conservatively last through a volatile stock market cycle, you would want a lower withdrawal rate. Could you live on $11,200 per year? This will work out to $933/mth in expenses. And at the end of the 15 years his allocation to spending actually increased to $34,000/yr. What if you are not as Privileged to Start off with Such High Income? Kyith, my situation is not like this, this isn’t helpful at all! And my answer to you is that yes you are right but this is helpful. Whenever we hear stories or account of people able to do this, we tend to be dismissive about it. The reason is that we are afraid we would not be able to reach the level they reached. So we used this as a coping mechanism. You cannot run away from this maths. And I didn’t earn this amount of income when I started off, even if I can considered to be in the STEM field. I failed miserably in my career by my own benchmark. You might not need $1 million to provide optionality. Optionality can be secured with $150,000 if all you cared about is feeding yourself $750mth or $9,000/yr. This could take you about 3 years and you could use a portfolio of 3-5 real estate investment trust (REITs) that provide a dividend yield of 6%. You could experiment with life much earlier instead of 15 years. Your expenses could be less. Your parents do not need your allowance and are perfectly Ok with you being responsible and saving up for it. They help provide for home telecommunications, and 2 meals. You do not have to pay rental and your expenses could even be lower. No one lives the same kind of life. Yet if the end result is to be financially less stress, free, or the secure feeling, we all could achieve it in our own terms. If you do not meet up to that, choose your values and priorities, play with the wealthy calculator, visualize what kind of wealth you can build, learn from my resources provided here. hi! long time no see my friend! Yes marriage makes a difference. Having a child makes even bigger the difference. I have tried your method of living like a hermit for a few years when I was single. My savings shot like a rocket, since my expenditure was about 1k though I was in a full time graduate programme, supplemented by tuition income. Very beautiful nest. However, since I got married, have a kid, my savings gradually level off. It is a disappointment to look at my savings account nowadays. Nevertheless, luckily savings from my earlier days has painted a good picture of my finance levels, but I know I would never reach the kind of saving rates prior to having a family. Hi jomel, I gotta correct you a bit. I probably don’t live like that haha. if he live with only 933 per month, I think he came from a rich family or he don’t haf to give allowance to his parents and the house he is living in doesn’t need him to help pay those utility biils..
i beg to differ. as pointed, it is the lifestyle you live. if the parents are ok with u giving 200, you paying 150 of groceries, traveling 100, 100 handphone and msecleanous, 200 for food, 150 for insurance, then by all means! thats only the first year. at 25.
of coz… u r right.. if the parents are ok with it.. but tis type of lifestyle is not easy.. if a person mind is not strong enough, they might went to emotion distress. I know of a lot people whose income is only 2.5k, after cpf, they only take home 2000. saving up 50% n spending only 1000 a month on those necessity means this guy had no entertainment or social life. yeah it is a lifestyle too.. I personally had tried it n its really not easy… ur life will be only work and home…becoz whenever u go out it means spending money. 3) time is a resource that can never be bought back. but i must say there are alot of folks who have a certain lifestyle. its habit my friend. some people of certain nature (those that are sensing and thinking) may like a consistent lifestyle. one investor i know is a SAF person drawing 2400 gross so his amount is even lower, yet before 30 was able to build 100k. he lives like a hermit, but you wonder if some shortcoming is there to a life like that. sometimesits all about knowledge. u may be super aware of personal finance, but what if you try to advice another person but the person just don’t see it? it may be the case like how YOU do not understand about health and some simple standard things to omit from your diet. I tried explaining to young investors on keeping a watch on how much they drink and fried food, they passively ignored about it. its really what you want to hear sometimes. Yeah.. a lot of people say want to invest so that they can retire early or don’t need stick to 8-5 job. but when u told them the plan, they will say its crazy.. I myself live as hermit for 1 year.. its really unbearable for me. lifes needs a balance.. so I set a longer horizon for my freedom instead.. I think true hermits are Ok about it really. Remember what is important is that you accept that way of life. If you find it unbearable then it is likely something you don’t enjoy. The idea is good, but if the individual is a high flyer the salary growth is too conservative. Over 15 years I would expect them to be promoted or move jobs 5 times, with a salary increment at least 10% each time. Basically the end salary will be significantly higher than modelled, making this even ‘easier’! To be slightly more realistic, the scenario can be tweaked by lowering the starting salary and adding salary jump (modelling promotion) in the 5th and 10th year. Also can include the employer CPF contributions. Off-hand, those who get married earlier, buy HDB flat early and have no kids till late 30s could be better off than a single who never buy properties. Imagine the couple buying Boon Keng DBSS or Duxton at BTO. hi Thinknotleft, thanks for visiting. I think you may be correct that the salary jump significantly take place further down the road. You are right on those dual income with no kids. they may have synergy in their expenses and double the income. but should they aim for 1 mil? I always fell into that trap when i realize how fast a family achieves 1 mil. and then i realize they have 2 income. but what is the rational to include CPF into our computations. hi, the employer CPF contributions go to your CPF and are part of your wealth. And employer CPF contributions are 15.5%-16% of one’s salary. Hence it is not insignificant. On DINK (dual income no incomes), they should maybe aim for $2mil: $1mil per person. After all, its two persons with dual income plus shared expenses. i think, if i included my cpf (which is not used to purchase a home) i can considered to have reached that number. yet if you contrast to folks in other countries, they might not consider their contribution to government pension as part of their networth. this is just to be safe. i wonder if your expenses really double when you get married. research seem to point to 1.6 times your old expenses. Hi Kelvin, sometimes it is not so much about the purpose at the end but for a post to bring up particular questions. Financial security and stability is a good purpose for some. Some have a bigger and audacious goal to stop working. Others don’t even want to consider both. A post like this puts things up front for some to question the maths. Is this possible at all? But it also puts out the question, is it right to chase after 1 million dollars by a certain age. A lot depends also on our life style. For example, Having home cooked food instead of eating out at restaurants. Meeting friends for coffee instead of a meal. Engaging in free or affordable activities. Museum, libraries, parks, beach etc. Watching series/films online instead of at the cinema. Taking public transportation/walking instead of driving. wearing affordable clothing instead of expensive branded goods/clothes. also, maintaining a minimalist lifestyle instead of having excessive belongings. living in a small bto flat instead of a condo. hi RN, thanks for sharing. yes there are many variables. i find that those who are able to harshly look at their situation and attempt to make some moves to see if they can still be comfortable with changes tend to do well. spending 20k per year does not always mean you are suffering. I think that you are right not to consider CPF as part of the equation. CPF can only be withdrawn at 55. 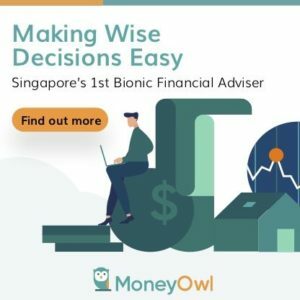 Furthermore, not all the fund can be withdrawn at that age, taking into consideration of the min sum (which is set to be increased as the year progress). The example you have quoted is the person who is said to have a remarkably high remuneration at the start of his or her career. Not all ppl can have such high salary at the initial of their career. I think that the majority of the ppl are unable to achieve $1 million by the age of 40. That being said, I am of view that it is not the amount that matters. 1) Increase the saving rate. 2) Invest on regular basis. I am confident that one will be able to achieve financial independence before the age of 40. The amount does not have to be $1 million. My min worth of opinion.